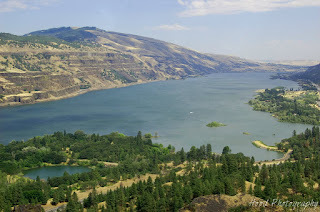 I took a trip east about 55 miles to the town of The Dalles, OR. The scenery is so much more dry there, but the gorge is just as beautiful. It is amazing how different it looks from what I am used to here. since it is such a short drive away. Great pics in this and the post you linked to -- we lived in Eugene for years and had family in Eastern Washington, so we made the trip up the Gorge a zillion times -- you could actually see the line between western and eastern Oregon between HR and the Dalles. We've also flown over the area and you can see it from the air! Great pic. I love how you can see the geology of the area in the bluffs. Wow, love that shot... it is a great view! magnificent view! i love the small lake.